Notes: Floral Notes, Magnolia, Chocolate, Tonka Bean, Cinnamon, Agarwood, Sandalwood. 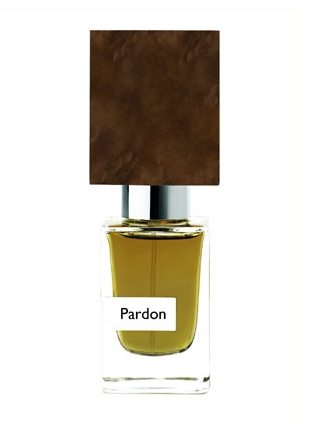 Pardon opens with a blast of synthetic oud a-là Montale joined by a chocolate accord and a considerable amount of tonka beans and cinnamon. It immediately reminds of Gualtieri's previous Duro and, for a few aspects, of Guerlain's L'Insant Extreme but where the former introduces leather and the latter shows the typical sweet vanilla base of many Guerlains, Pardon is joined by a strong woody/incensey base, floral patterns and an overall resinous-ambery vibe. While Pardon is far from evoking the typical image of a mannered dandy, at the same time is not as loud and "deafening" as other deliveries from this house. Sort of a Nasomatto with a sore-throat. Don't get me wrong, Pardon remarks its presence very clearly but it doesn't cross the border of vulgarity. Nice sillage and great lasting power. Overall I'd classify Pardon as a very contemporary, trendy gourmand that while being quite enjoyable and not particularly juvenile, it won't surely leave a trace. In the meantime, enjoy your bottle as this is probably one of the most succesful deliveries from this house.